Remember, Jen, that the modern game review scale is being applied... a ranking of 78 is being assessed as meaning terrible, with the poorest reviews being put forward as the definitive viewpoint. If the game style floats your boat, I reckon it's probably gonna be fun for you to play. Maybe not worth the £60 digital storefront price, but something to look out for when the price has reduced. Oh don't worry I'm applying the usual corrective measures for the modern review scale! The problem is I then have to apply the adjustments based on my past enjoyment of the reboot games. I went with the "pick it up cheap and you'll probably have some fun" approach with the last two as I wasn't sure about them. The result was that I liked but didn't love the 2013 reboot and have struggled to get more than ~10% through Rise. If Shadow had been hailed as amazing I would have jumped back in, but I think the spread of reviews is making me think it's just not worth it for me sadly. There are just too many other things to play that I'm confident I really will enjoy to take another punt on Lara right now! Can't disagree with her on TR1, TR2 and Last Revelation, loved those games. She gave it a 4/10 by the way for the Telegraph, a lot of other reviews are also pointing out that she just falls through ledges rather than grabbing onto them. Or based on current trends they'll just go and remake Tomb Raider 2. Which to be honest I'd be very happy with. 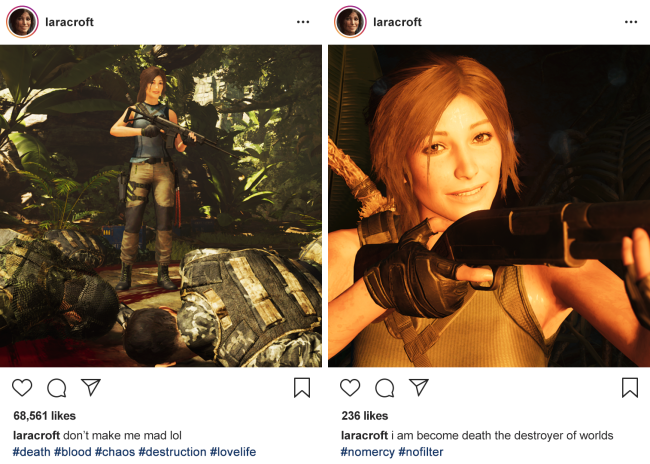 But to me she's always been more Lara Croft than Tomb Raider; an adventurer, a globe trotter, an explorer...and in my mind that allows them to constantly keep playing with the character. 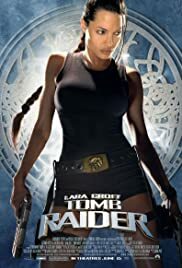 Tomb Raider is a legacy name, so I've never bought into the philosophy that she has to be raiding tombs. Maybe a tomb, but it's just as appropriate if she's plonked on the London Underground (that would be the torturously difficult 3, BTW). As a concept I rather liked Angel of Darkness as well, it was the execution that let it down. I do hope whatever they do with her though that she becomes more Angelina Jolie/Chloe Frazer (Uncharted) esque. The current voice actor doesn't appear to have the charisma or WITTY BANTER needed to pull it off however. The original Lara Croft exuded confidence (though more in an implied sense; I think the marketing personified that more than the games explicitly did) and that's also been somewhat lost. But then they did it with James Bond as well. They wanted to make him more vulnerable and 3 dimensional. And for the most part it worked, but now like Tomb Raider people are a little bored with that, and it's time to reinvent the wheel again...which oddly is usually to revisit the past. After 5 years of Camilla strawberry floating Luddington I'd be quite happy for them to reboot and just base her on Angelina Jolie's portrayal at this point. KK wrote: But then they did it with James Bond as well. They wanted to make him more vulnerable and 3 dimensional. And for the most part it worked, but now like Tomb Raider people are a little bored with that, and it's time to reinvent the wheel again...which oddly is usually to revisit the past. 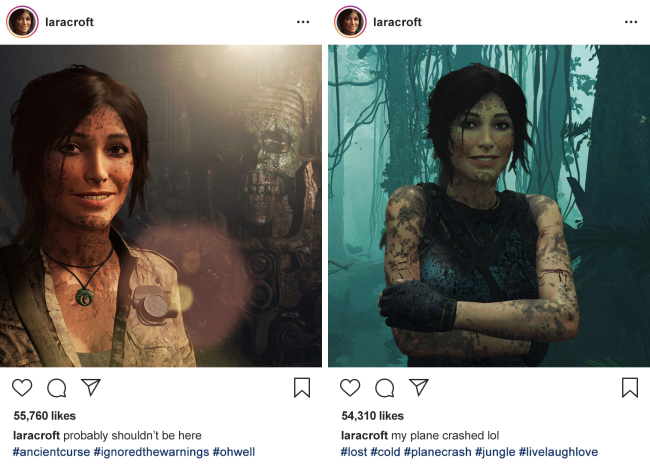 That's a great analogy actually, where as they succeeded in adding depth to Bond with Daniel Craig, Luddington's Croft is nowhere near the original Lara in terms of looks or character. The reviews to seem to be quite all over the place, guess it kinda down to if you like this new style of Tomb Raider games or not. Will go for it, but once it hits the sales. Brerlappin wrote: I dont know how CD seem to keep getting this wrong. But I agree. It seems this time they wanted to say something about the white saviour complex, and the consequences of simply pilfering cultural heirlooms...but ending up making a game about a posh girl with a white saviour complex pilfering cultural heirlooms. Oh, and they threw in a load of cultural appropriation too. 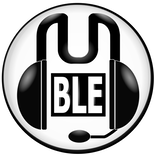 The waypoint radio podcast discussing this is great. A lot of spoilers, but the depth it goes in to about where the game falls down with its tone and messaging is good. They even talk about how the game was basically destined to fall at trying to be "woke" because it's still being a AAA Tomb Raider game, and how this trying and failing is actually worse than the old TR games just being nonsensical Indiana Jones style fantasies. Is that genuine? Does the PS4 version not show those lights? I will still pick this up despite reviews, I loved 1 & 2 and if this is mor of the same then i’ll take it. I will hold off for it to hit £25 though, hopefully by then a lot of the performance/animation issues will be addressed with patches. That’s one of the biggest things about buying games at launch now - those that play it a month or two later are actually getting the better, more complete product...for less money. See also Shenmue 1 and 2. Tafdolphin wrote: Olivia White (formerly Raze on old GR) did the Telegraph review, and it's probably the best one out there. I can't read it because I'm not signed up to the Telegraph, Taf, but I can see that it has awarded the lowest ranking - by quite some distance - to the game out of 44 reviews. What was in it to make you suggest it is "the best one"? Ak, that's really frustrating. For some reason I could see the whole review on first clicking it but now it's behind a paywall. Anyway... it was just a really nicely written piece. It summed up the mechanics nicely and, unlike the Gamespot and IGN reviews, dove deeply into the plot problems as well. The Waypoint review does this too and raises many similarly excellent points, but as always with that site it's far too long and rambling. EDIT: Seconded by another GR alum. Add much as I like Chris that wouldn't put me off this game as it's about as it's on the opposite end of the spectrum to his tastes and judging by her other reviews the same could be said of Olivia. Not saying anything in the review is wrong, just that we obviously don't like the same things. Olivia is one of my quality barometers on twitter...if she likes it, I probably will as well. Chris' tastes tend more towards Japanese releases, which I tend to bounce off of more often, but if he likes something it's likely there's some merit there. I just had a quick browse at her other reviews and there are lots of 5 stars for indie games that aren't my thing (notably, Cuphead) so I'd say our views area a little different. However seeing how she would score the other TR games, especially the two newest games gives the score a lot more context. Maybe the change in developer has been particularly significant. It's been while since I had casual talk with her but I do feel our tastes match, so I'm pretty sadden to hear her opinion on this one. Was gonna be my Christmas game but now I think I'll just wait until it drops in price before I get it. That’s hilarious, especially after the waypoint review! As it turns out Rachel Weber's reviewed it for Gamesradar: https://www.gamesradar.com/shadow-of-th ... er-review/. Fair to say she rather liked it. "The final and strongest entry in the rebooted trilogy, this adventure sticks to Lara's strengths while embracing its dark side. 4/5." tbf, Andy Kelly has now done a full article on it, and created the fake insta account quoted above. Also, definitely worth re-upping. 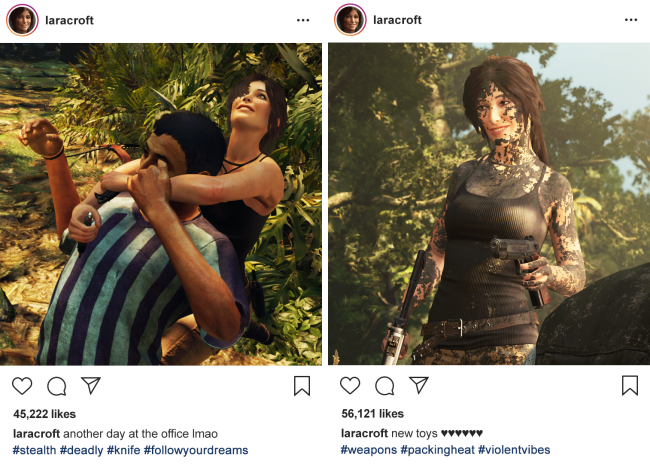 I was just thinking why Lara Croft doesn't have an official instagram, but then noticed they've registered it but just don't use it. Were she real you can most definitely imagine her having one.